For some time, I’ve been exploring ways to ease or reduce paddling in reaching some of my farther off fishing sites. I’ve researched motorizing my Wavewalk with both gas and electric models but, in the end, don’t want to add even a minimum of 30-40 pounds of weight, or put up with the added hassle of keeping gas, charging batteries, related maintenance, and anything other than a totally quiet experience on the water. 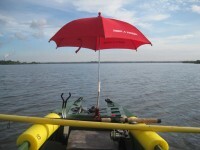 I’ve also taken a few umbrellas out with me exploring whether any might ease my journeys and save me a bit of paddling, but most were not practical, did not stay securely in place or allow me to paddle and steer when deployed. Not that I’m lazy, mind you; I still enjoy getting my exercise, but at age 72, I could use a bit of relief on my 8-10 mile paddles. 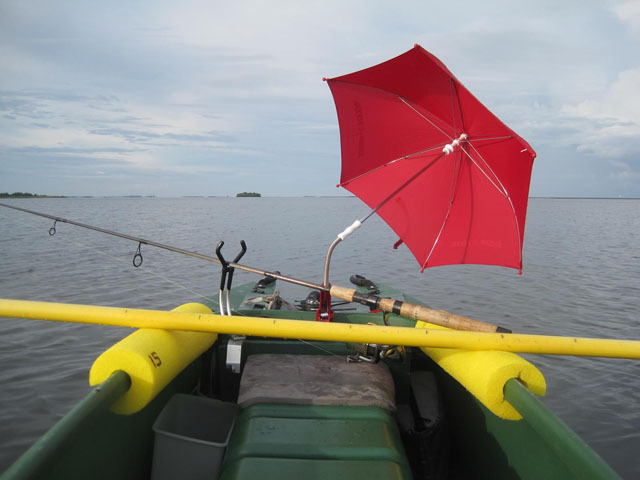 While looking at umbrellas online a few weeks ago, I stumbled across one from Radio Flyer that looked interesting. It’s specifically for children’s wagons. I ordered one, and I’m glad I did. I’ve had it out twice and it works well. 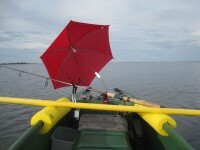 The umbrella is 31 inches high and 26 inches in diameter when extended which is large enough to catch the wind yet small enough to not totally obliterate my view going forward. It has a bendable, tilt handle which can be rotated 360 degrees, and stays in place when set. 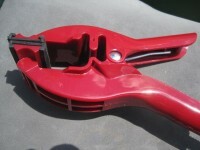 The powerful clamp (you need to use both hands to open it) attaches securely to the W’s cockpit rim via a groove that is intended to attach to the lip of a wagon, but looks made for the W. These features allow for a secure, hands-free operation, allowing me to paddle and steer at the same time that the umbrella propels me forward. 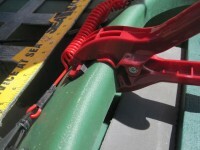 The clamp can easily be slid or moved to any portion of the cockpit lip, but works best for me when positioned directly in front. 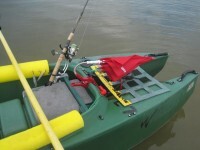 When not being deployed, the umbrella, still attached to the cockpit rim, folds down and totally out of the way for fishing. When positioned on the side of the W and pointed downward so that a small portion of the umbrella touches the water, it might even serve somewhat as a makeshift sea anchor or outrigger (however, I’ll have to experiment more to determine related usefulness). And, of course, it can provide a bit of shade. While the umbrella is an option only when the wind is blowing roughly in the direction you want to go, if you’re like me, and plan your trips to take advantage of the tide and wind, it can provide a nice boost. I won’t be setting any speed records with my umbrella and won’t be challenging Yoav to a race in his souped up W, but I think the Radio Flyer may just make a few of my longer paddles a little more relaxing. I’ll be ordering a couple more for backups, or maybe to deploy two at once. Thanks, Yoav………Don’t know if the umbrella is large enough to reach great speed, but anything is welcome. Wish I could get one in green. Right, Pete, except for the color. My green one was just a prototype. 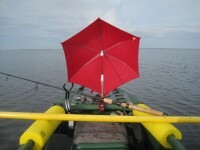 The size of the umbrella was a significant limiting factor. 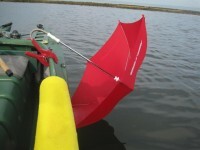 However, one big enough (aka golf umbrella) would make visibility a problem. So I have been on the hunt for a large clear umbrella. Significant sail, plus visibility! When I find and deploy it I will post it up. Good luck finding a clear one, Chris. I’m ordering a 2nd Radio Flyer, and will try placing them on opposite ends of the front cockpit, thereby leaving some viewing space between them. Right, Marco…….if I mount 2 umbrellas on the forward cockpit rim, 2 on the rear rim, and one on each side, I might even be able to soar above the waves. Yes, but can you fish from an airplane? Sure, PaulZ………I’ll just target flying fish.